Phoebe likes Gage, but there's a problem - he's her brother's best friend. As the result of an extra-marital affair, Phoebe Bautista has had little contact with her dad, non with her step-mom, and her siblings have just recently learned of her existence. Now she goes to stay with them while her mom is on assignment in The Yukon for three months. As she tries to find her place and navigate the developing and rocking relationship with her temporary family, she begins to spend time playing music with her brother, Oliver, along with his best friend, Gage. Gage is cute, smart, has selective mutism, and makes Phoebe's heart skip a beat, but she know she has to fight her feelings go him, so she doesn't ruin her growing bond with Oliver. But the more time the three of them spend together, the harder it becomes to ignore what she feels for Gage, especially when she learns he might like her too. And with her dad pretending everything's fine, the fact that she might never belong anywhere, and knowing she only has so much time with her new family, Phone might not make it out with her heart intact. For some crazy and bizarre reason, I have caught the contemporary bug. I've ended up requesting, accepting and looking into more and more contemporaries as time goes by. It is such an odd feeling and I have no idea what to do with it. But here we are. Here I am, starting a new contemporary read. I am excited to see the romance between Gage and Phoebe grow and develop, but I am also interested to see how the bond between Phoebe and her brother, Oliver, grow. A huge thanks to Xpresso Book Tours for hosting this review opportunity and for allowing me to take part in it! I am excited to see where this book takes me! Just a quick disclaimer to those reading this review. I have received this book for free in exchange for an honest review. No money on my behalf has been spent in receiving this book. Please note that this does not affect my opinion in any way. All thoughts are my own. The writing in this book was pretty good, in the sense that it was simple and easy to get into. The author didn't try to be fancy. Instead she let her story do all the work. I found myself really enjoying the feel of this author's writing. I did find a couple of typos but I quickly overlooked them because the way the author wrote just made me read like no tomorrow. I really enjoyed this and even if I could deliver more critical, I wouldn't be able to because this book was literally too adorable. Oh my gosh. It was so cute to read this book. I literally sat and ooo and aaah -ed all the time. It was down right adorable and I just couldn't put it down. It was physically impossible at one point. I think what I liked most of all about this book was how much I was able to relate to multiple parts of this story. The awkward romance that got better, the fact that you don't seem to fit in, gosh the list could go on. 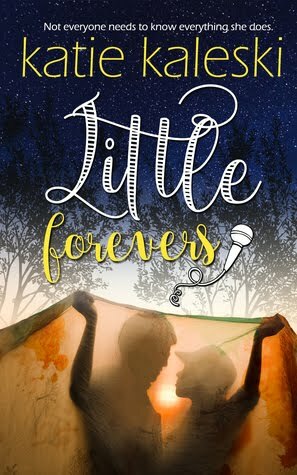 This is just one book that you'd want to read not because of the great romance or the cute little moments but rather because it makes you feel included. It might answer a couple of questions that you have and if anything, it might make you feel happy. The characters were an absolute blast to read about. They each had their flaws or their problems that they struggled with and it made them so well rounded and believable. I had no problem envisioning these characters. I loved how the story came together in the end though. It was really amazing to see how these characters developed and how their reactions changed over time. I also really enjoyed the diverseness of the characters. They are really a great set! Overall, I couldn't have enjoyed this book more even if I tried. This book pretty much is what I think a contemporary should be like. It drew me in with the plot of a cute romance but it help me in place with its flawed characters and amazing plot. It was definitely something that I would read again. I am so, so impressed with it. Thank you so much to Xpresso Book Tours for hosting the review opportunity and for allowing me to take part in it!